We are glad to announce that a new Yunus Social Business Centre opens its doors! The newborn Yunus Social Business Centre is located at the Bethlehem University and was promoted by the School of Business Administration. The research centre and social business incubator will spread a new business approach in Palestine, by engaging the private sector in the development of local communities. We are really glad to see that the Yunus Social Business Centre network is expanding, bringing the social business culture in many different areas of the world (Asia, Europe, Middle East). 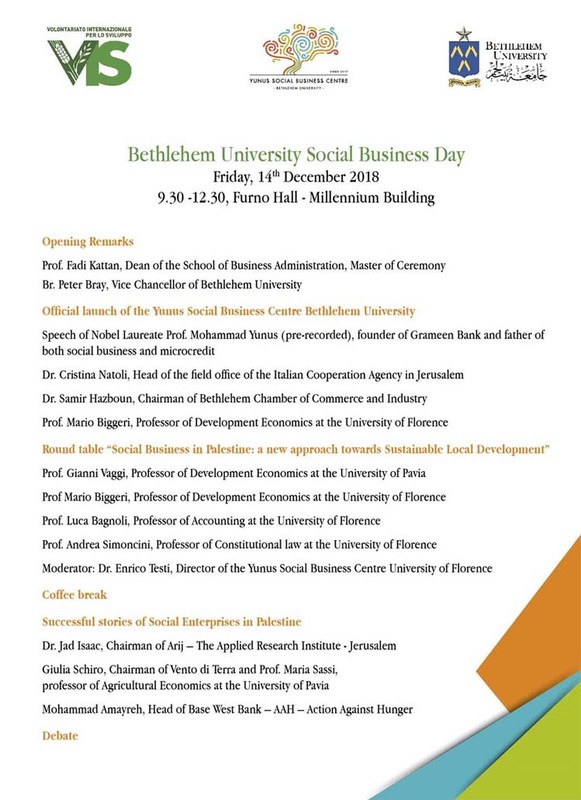 The launch event, organized by “VIS – Volontariato Internazionale per lo Sviluppo” and Bethlehem University, will take place on the 14th of December.. A video message from Prof Yunus himself will open the ceremony and give way to the official launch of the social business centre! A round table with the members of the scientific committee will follow. The committee of the new centre of composed of several members, among which our Director Enrico Testi and Prof. Biggeri, Prof. Bagnoli and Prof. Simoncini, our Scientific Committee. Then successful stories on social enterprises in Palestine will be shared thanks to the contribution of an amazing panel of speakers, both locals and Italian, bringing to the table their experiences in Palestine.